Winnipeg strongman Dustin Byfuglien won’t stop asserting his dominance against lesser men, as the Vegas Golden Knights learned once more in Game 3 of their series tonight. 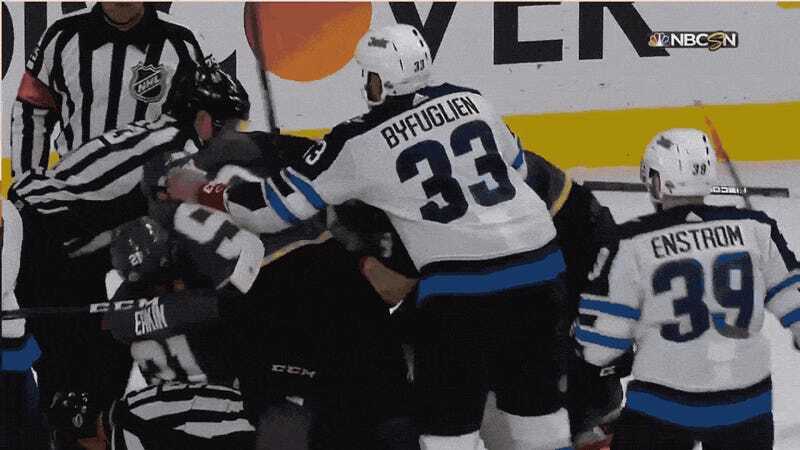 In a big testy scrap near the end of the second period, Byfuglien grabbed hold of both Tomas Nosek and Colin Miller—who are listed at 210 and 196 pounds respectively—and pulled both to the ice by the backs of their jerseys with one mighty tug. Byfuglien was not penalized for his show of strength. It was a weird scrum all around, with Marc-Andre Fleury even resorting to some subtle pestering of Blake Wheeler. All’s fair as long as you’re not licking.